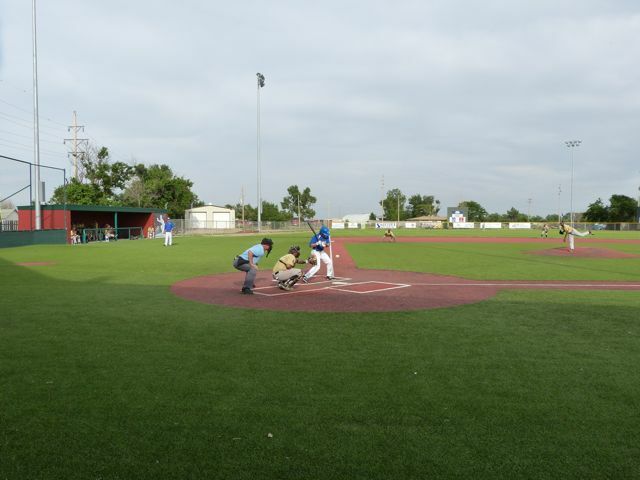 The Garden City Wind is a member of the Pecos Independent League. 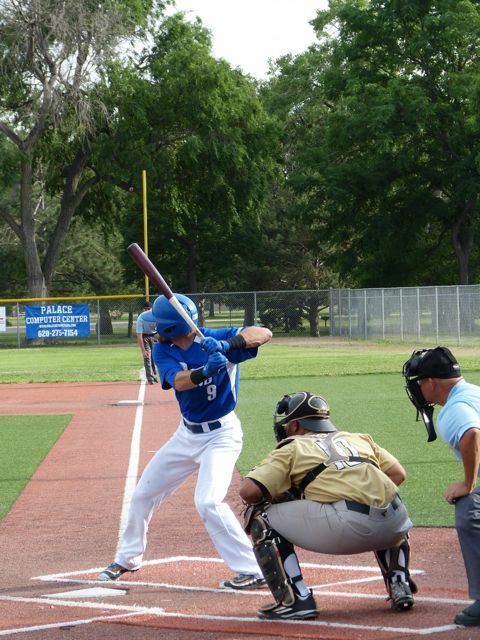 The Pecos League is spread from Kansas to New Mexico/Colorado to California. 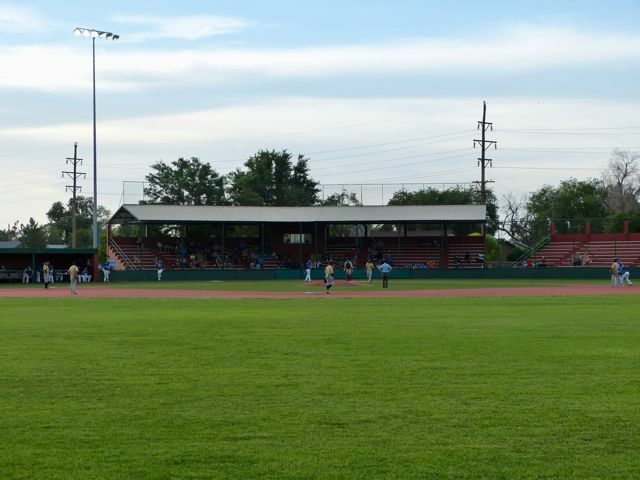 The Wind plays at Clint Lightner Baseball Field in one of the local parks. 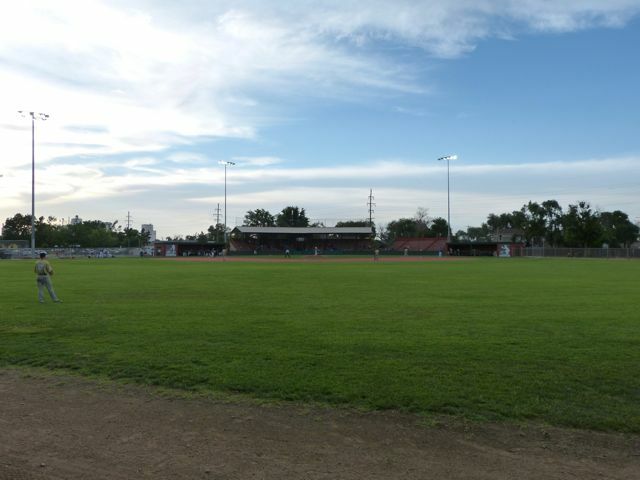 The facility opened in 1920 and the covered grandstand was rebuilt in 1936. 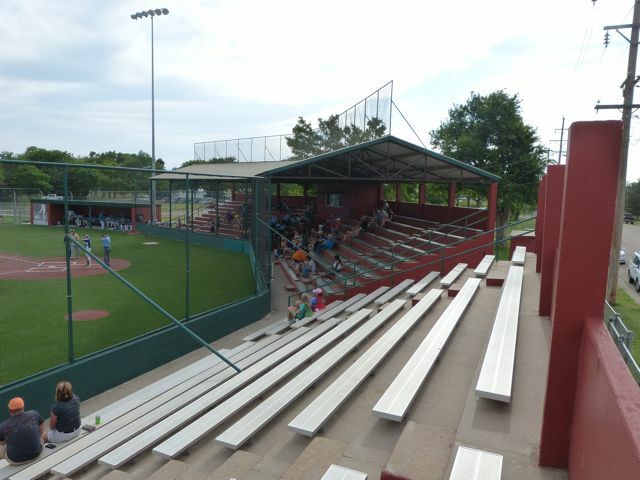 The uncovered seating down the third base line was built in the 1950's. 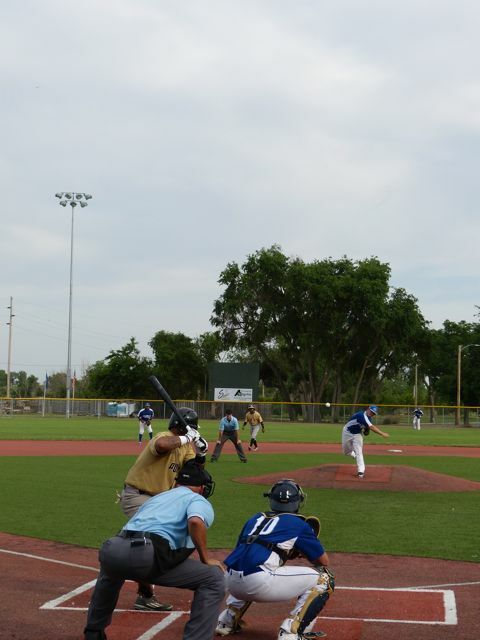 The Wind were playing the White Sands Pupfish, from Alamogordo, NM, winning 14-8. 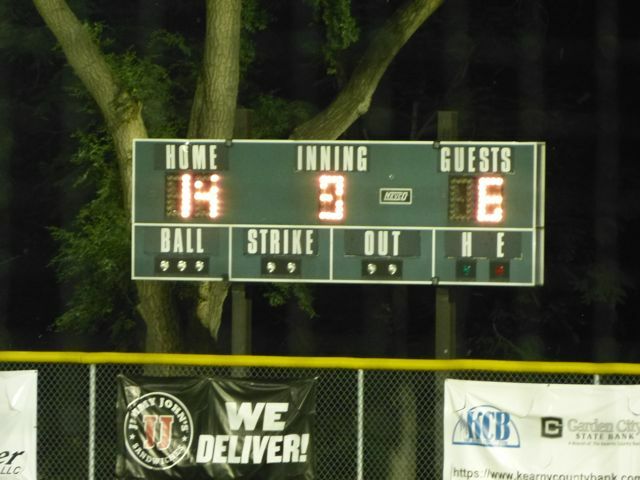 The box score was Pupfish R-8 and Wind R-14. 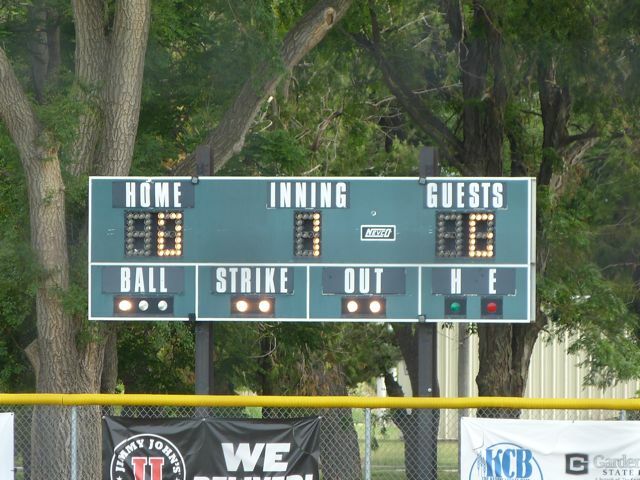 The scoreboard doesn't show the other information and I was unable to get to the Pecos League website (Norton's didn't like it). The field lines are RF- 305', CF-385', and LF-340'. 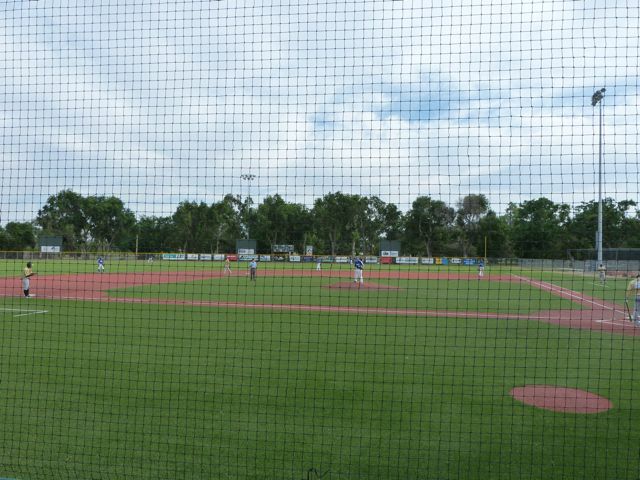 The outfield is grass and the infield and behind home from 1st base to 3rd base is artificial turf. No DH in this league, the pitcher bats. 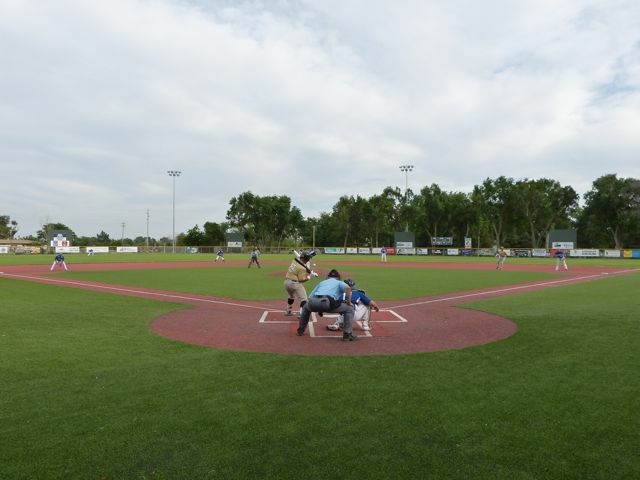 No ballboys, players pick up bats and take or toss them to the dugouts. 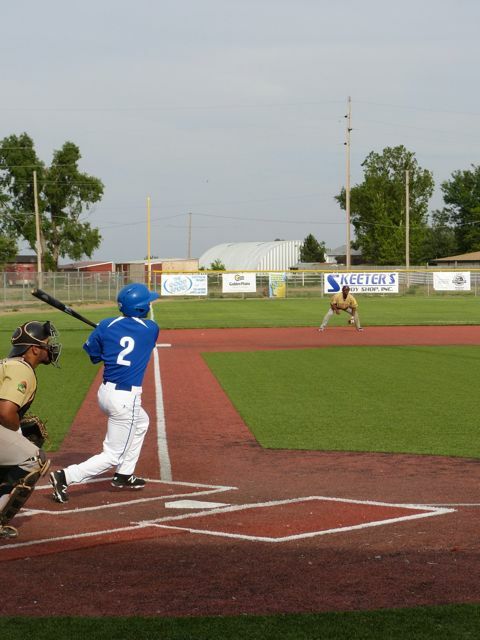 Umpire walks to home dugout to get more baseballs. 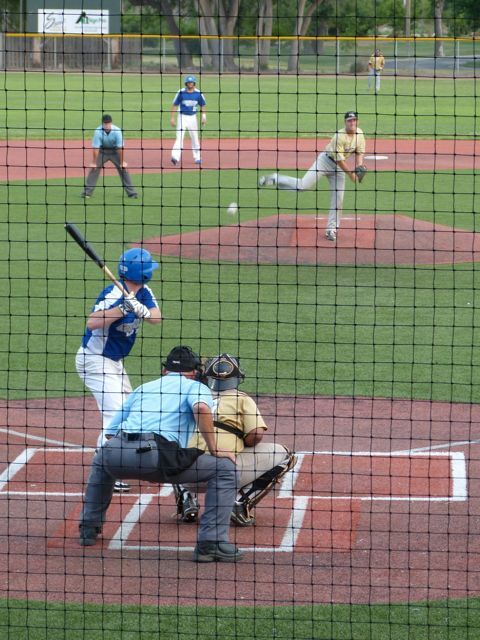 There are only two umpires. 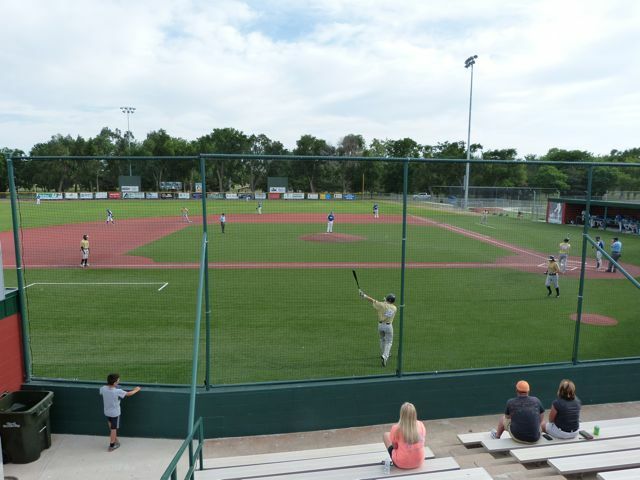 The players in the Pecos League drive themselves from ballpark to ballpark. As usual for independent league teams the GM is involved with everything. 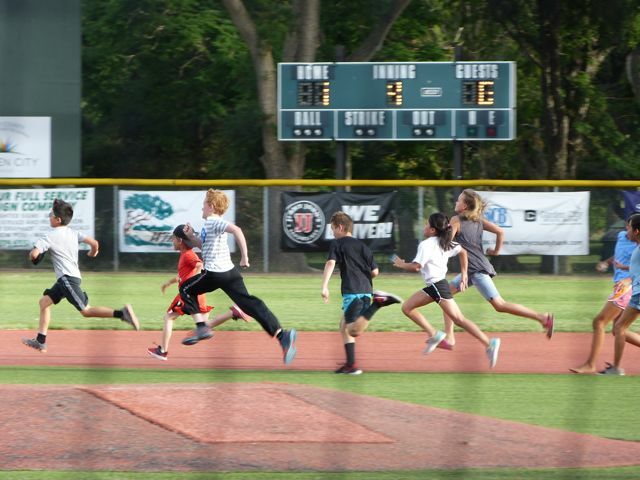 Shown is the Garden City GM Marcus Sabata getting the children ready to run from 1st base to 3rd base as a between inning fun activity. 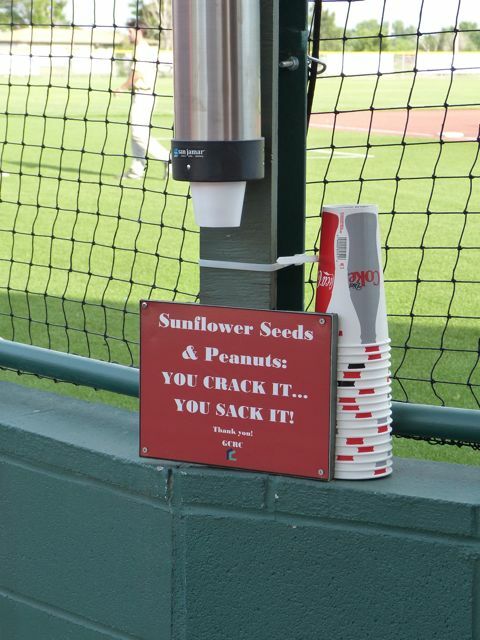 In order to keep the seating area clean cups are provided to put sunflower hulls and peanut shells in. On the right field outfield wall is a sign incentive for the players to win a steak, provided by the host families. 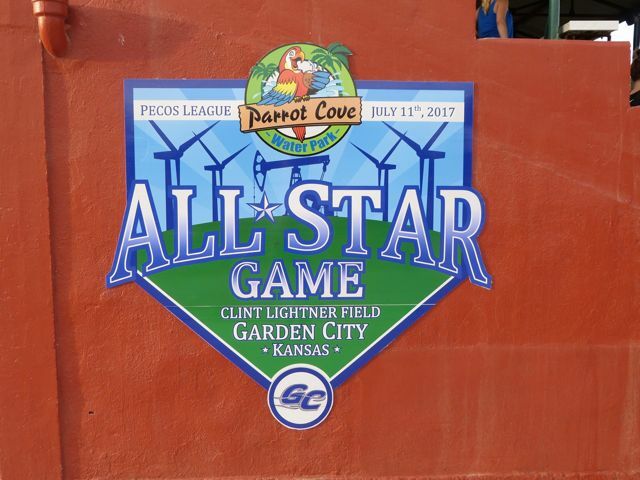 The Pecos League All-Star game will be played at Garden City in 2017. Lots of families at the game, with the children having a great time. 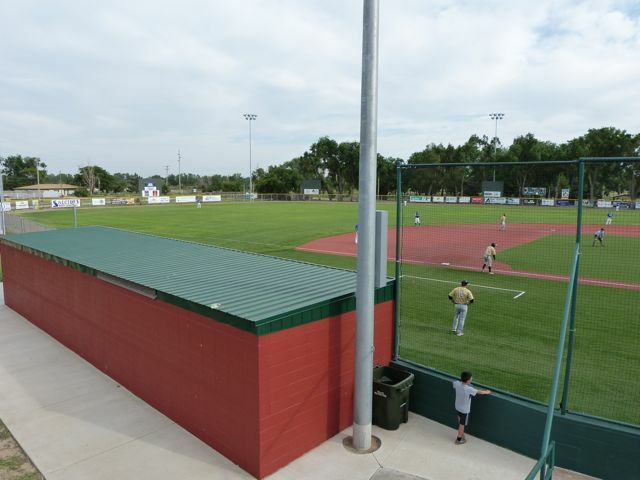 Tickets for Pecos League games are only $6. When a Wind's player does something great a fan will say, "Way to go Wind!" The other fans respond with, "Wooosh!". The dizzy bat race is done differently. 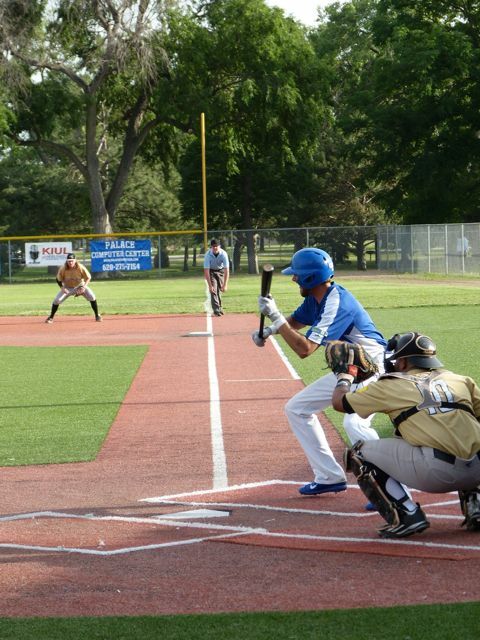 One contestant at 1st and the other at 3rd, 10 times around the bat and then run to the opposite base via 2nd base. For the Pizza Hut Roll, two contestants stand at 2nd base, where they get three chances to roll a baseball to 1st base, closest is the winner. 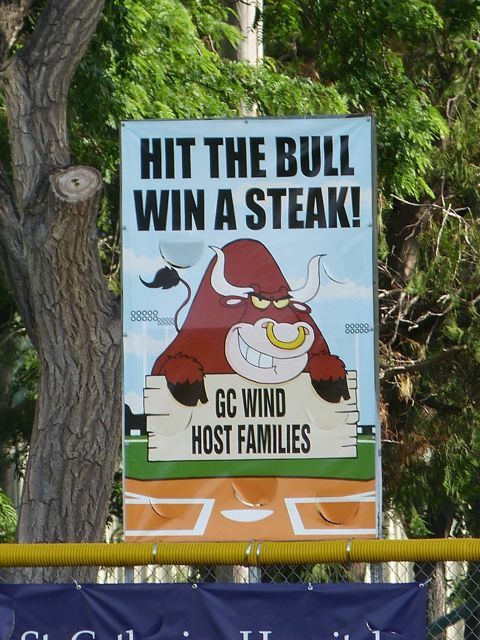 Windy is the mascot, but was not to be seen at this game.